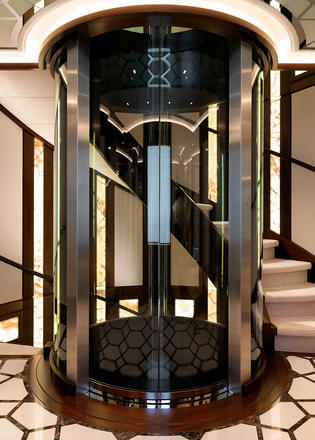 Superyacht elevators are a must-have feature on many levels — they improve accessibility on board, create a sense of flow between different areas of the yacht, and provide a strong focal point for the interior design. 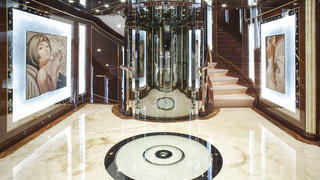 This glass-encased elevator, flanked by spectacular artwork in the main foyer, provides access to all three decks of the 61 metre James Bond-inspired Benetti superyacht Diamonds Are Forever. Launched in 2011 for serial yacht owner John Staluppi, her lavish interior was designed by Evan K. Marshall. Guests have plenty of options for relaxing on board, including a full beauty salon. 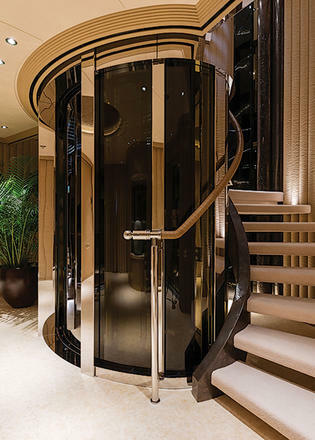 Superyacht elevators are a must-have feature on many levels — they improve accessibility on board, create a sense of flow between different areas of the yacht, and provide a strong focal point for the interior design. 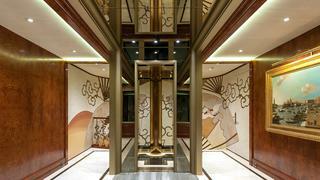 This glass-encased elevator, flanked by spectacular artwork in the main foyer, provides access to all three decks of the 61 metre James Bond-inspired Benetti superyacht Diamonds Are Forever. 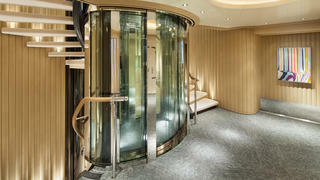 Launched in 2011 for serial yacht owner John Staluppi, her lavish interior was designed by Evan K. Marshall. Guests have plenty of options for relaxing on board, including a full beauty salon. The entrance lobby on the 82 metre Blohm+Voss superyacht Graceful features a grand staircase, but the star of the show is a large glass-sided elevator that provides quick access to all decks. London-based studio H2 Yacht Design created the interiors for this steel and aluminium yacht, which was ten years in the making. The entrance lobby on the 82 metre Blohm+Voss superyacht Graceful features a grand staircase, but the star of the show is a large glass-sided elevator that provides quick access to all decks. London-based studio H2 Yacht Design created the interiors for this steel and aluminium yacht, which was ten years in the making. 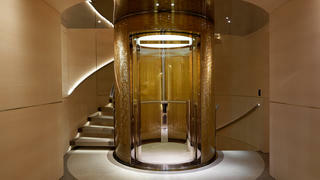 Another of the world's finest superyacht elevators can be found on board the 95 metre Lürssen superyacht Kismet, whose lift is accessed via a lobby decorated in rich brown hues, setting the tone for the rest of the yacht and her dramatic Reymond Langton interiors. Abeking & Rasmussen superyacht Kibo delivers a timeless example of superyacht elevator design, with her glass-sided lift providing access to all four decks. British designer Terence Disdale created the interior décor, which features ridged wall linings and calming beach club tones. Another glass-sided masterpiece, the superyacht elevator on board Feadship’s May 2016 launch Joy perfectly reflects the fresh approach that Studio Indigo brought to this project. Connecting all three decks on board this 70 metre yacht, the lift gives guests glimpses out to sea via the floor-to-ceiling windows, which are just one of the many innovative exterior design features on superyacht Joy. Another glass-sided masterpiece, the superyacht elevator on board Feadship’s May 2016 launch Joy perfectly reflects the fresh approach that Studio Indigo brought to this project. Connecting all three decks on board this 70 metre yacht, the lift gives guests glimpses out to sea via the floor-to-ceiling windows, which are just one of the many innovative exterior design features on superyacht Joy. 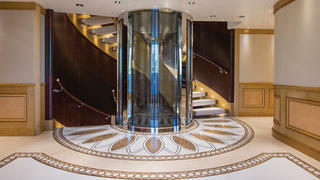 The centrepiece of Lürssen’s highly original superyacht Elysian (ex-Ester III), this elevator is typical of the understated elegance that runs through all four decks. The foyer surrounding this lift features a grand staircase with a bronzed banister and a carved leather surround showing cranes in flight. The flagship of the Perini Navi-Pichiotti fleet, Grace E features a spectacular superyacht elevator that is decorated with gold thread and encased in glass panels. The surface of this elevator shimmers under the subtle lighting that is built into the handrails of the surrounding spiral staircase. The flagship of the Perini Navi-Pichiotti fleet, Grace E features a spectacular superyacht elevator that is decorated with gold thread and encased in glass panels. The surface of this elevator shimmers under the subtle lighting that is built into the handrails of the surrounding spiral staircase. The 61 metre Hakvoort flagship, Just J’s marries a distinctive overall style with exceptional attention to detail. Her superyacht elevator is a technical triumph as well as an aesthetic delight, as the shaft was built separately before being lowered into the hull from above by crane. 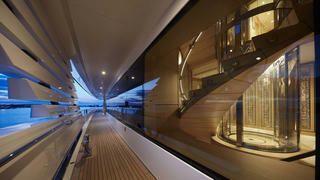 The 61 metre Hakvoort flagship, Just J’s marries a distinctive overall style with exceptional attention to detail. Her superyacht elevator is a technical triumph as well as an aesthetic delight, as the shaft was built separately before being lowered into the hull from above by crane. Another Abeking & Rasmussen yacht with a stunning on-board elevator, Romea was launched in 2015 sporting out of this world interiors created by Terence Disdale. Proof that superyacht elevators don’t have to be curved, the flagship of the Gulf Craft fleet features a square-shaped shaft. 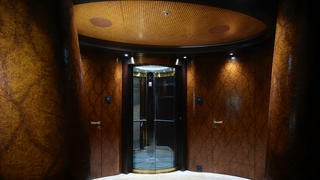 With a dazzling interior lighting scheme, this elevator provides easy access to Escape’s extensive sundeck. Proof that superyacht elevators don’t have to be curved, the flagship of the Gulf Craft fleet features a square-shaped shaft. 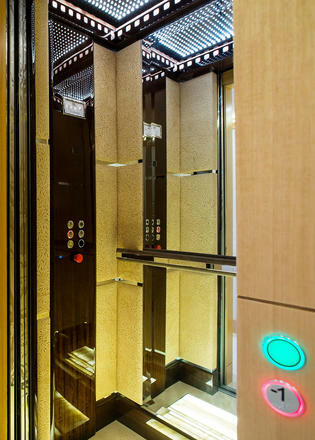 With a dazzling interior lighting scheme, this elevator provides easy access to Escape’s extensive sundeck.